You might not think that one of the strangest disasters in the history of the U.S. would make a good children's book, but author Deborah Kops thought differently. That's why she wrote "The Great Molasses Flood," about the day in 1919 that a giant tank holding two million gallons of molasses split open and flooded an entire neighborhood in Boston. Twenty-one people died when a wall of sticky goo swept houses off their foundations, collapsed buildings and crushed elevated train tracks. 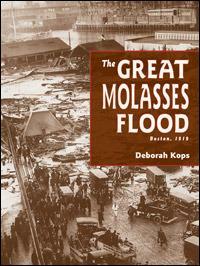 The wave of molasses was reported to flow at 35 miles per hour through the streets. This bizarre tragedy has been written about before, but Kops decided to tell the story partly through the eyes of children who lived through it. "Disaster books are almost a genre in children's literature, kids really do like to read about disasters," Kops told Here & Now's Sacha Pfeiffer. The judge in the court case that followed the disaster said that the U.S. Industrial Alcohol Company tank had been built in haste, with inadequate safety tests. The men playing cards at the firehouse looked out the windows and saw a dark wall that didn’t belong there. Whatever it was, the wall was coming right at them. “Oh, my God!” one of them cried. Two of the card players ran to the double doors leading to the dock, where the fireboat sat peacefully on the water. If they jumped into the water, they could try to escape the rushing wave. But the building suddenly turned dark as the molasses hit it and covered the windows. The men never reached the door. The ceiling came crashing down, and with it an assortment of wooden beams and heating pipes. Most of the men had no way to escape. A pipe pinned one fireman down, while a wooden beam trapped another. A third man landed near the fireman’s pole, with a piece of heavy wood and a steam pipe pinning him down in a painful position. John Barry, the stonecutter who had been watching the card game, lay under a beam and a water heater. George Layhe, who had been on his way to the third floor to take a nap, was in the most hopeless position of all: a big piece of wood lay on top of him, and over the wood was a heavy pool table and a piano. William Gillespie was one of the few men in the building who could still move. He was already on the third floor when the wave reached the building. His head hit a corner of the ceiling and he was knocked completely off his feet. When Gillespie got up, he felt dazed. Was he dizzy, or was the building really rocking? Every time he took a step, the building seemed to move. He was being pushed toward the sleeping room, where the beds were moving around as if they were caught in a whirlpool. Gillespie braced himself against a wall, afraid of falling out a window. He managed to avoid the whirling beds and headed downstairs. Then Gillespie saw the wreckage. The second story had collapsed on top of the first. He heard voices. “Get me out,” someone groaned. Another voice moaned, “My God, I am dying.” “For God’s sake, try and get me out!” a third man yelled. Gillespie quickly found four of the men who were trapped. He managed to move the heavy piece of wood that lay across the man near the pole so he could straighten out his body a bit. But Gillespie had to be careful not to step on another man’s head. He wanted to free the men, but there was molasses everywhere. And there was no equipment around to help him move the heavy pipes and beams. He needed to find some more able-bodied men—fast. Gillespie looked for an open exit, but the doors were blocked. He saw a window and jumped. Was he flying? It felt like it. He was getting dizzier by the minute. Gillespie had hit his head pretty hard when he was on the third floor. And the building was still rocking. Although he didn’t realize it, a section of the molasses tank had knocked the firehouse right off its foundation. This segment aired on February 21, 2012.